What’s better than shabu shabu? Organic shabu-shabu! On a quest to find a shabu shabu restaurant open late, I stumbled upon a new shabu shabu joint that opened two months ago in Anaheim Hills. This one wasn’t open late, but what really sold me was that this new restaurant boasted organic ingredients. I had to go the next day! 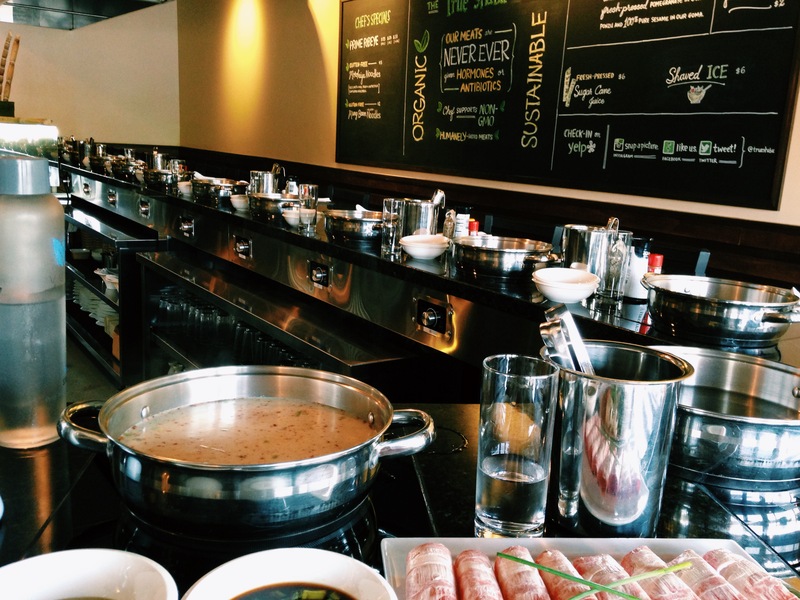 True Shabu brings a whole new experience to the shabu shabu world. For those who don’t know, shabu shabu is Japanese dish that consists of cooking thinly sliced meat in a hot-pot full of boiling water, usually a broth that you can enjoy as soup. While frequenting Asian restaurants or any restaurant for that matter, I sometimes ponder the integrity of the food. Yes, the end product is delicious, but I don’t know what goes into it. I avoid the typical fast food joints, but could I be investing money into something that might be just as bad for me? Alas, a shabu place built for the conscientious! 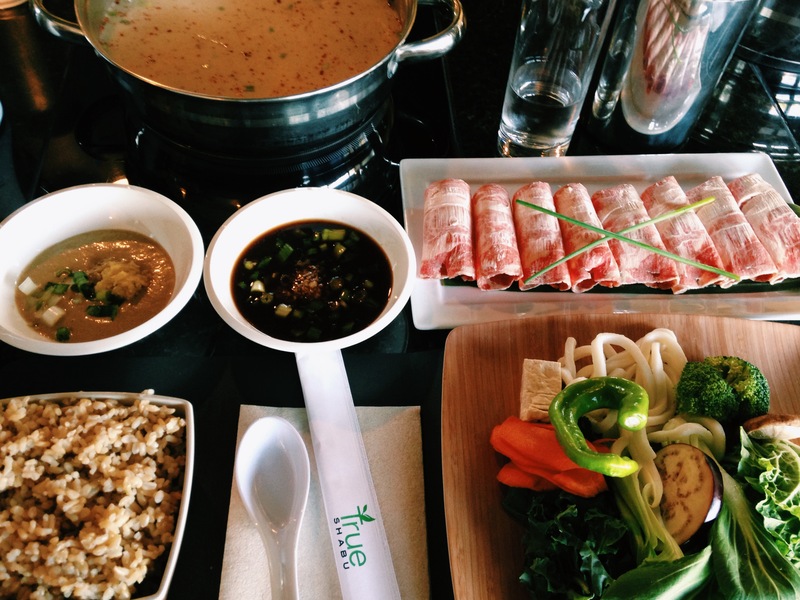 True Shabu promotes no antibiotics or hormones in their meats, no MSG, no preservatives, offer gluten-free noodles, quinoa, and even give you the option of grass-fed meats. All these things I never thought about while getting my shabu fix. Now it makes me wonder what I was really eating at the other places. I went with a friend whose favorite food is shabu shabu. Shabu for me probably makes top five. When walking into True Shabu, the atmosphere automatically wins us over; it’s so new, modern and clean. Our server helps us behind the bar and explains to us the menu. The prices are a bit higher and they charge you an extra 2 dollars if you want to make it a broth, but the price actually balances out with other places if you visit for lunch. Their base meat, the prime chuck, is the same quality you would get at other places for choosing a ribeye and it’s even better because you’re not getting hormones and antibiotics! I was busy trying to take a few shots of my meal, while my friend already got a mouthful in, raving on how good it was. I almost was gonna ditch the photos, but I knew I had to share this restaurant to the world if it was THAT good. It was THAT good! Their sauces- goma and ponzu are made in-house daily. The goma is 100 percent ground sesame seeds and the sugar in the ponzu is replaced with pomegranate juice that gives the citrusy flavors just the right boost for the perfect flavors. I usually don’t even care for the goma, but I fell in love with this one. The meat, paired with the ponzu… once it hit my taste buds, they did a little dance. Maybe a big dance! Everything tasted so much better than I could have ever imagined. It was like a whole new experience between shabu shabu and I, like when you’ve finally met “the one.” This was it. For all the shabu shabu lovers out there and for those who want to try something new to eat in Orange County, head to True Shabu in Anaheim. They make you feel like you’re dining in a five-star restaurant and I have to say, the organic and natural touch to the ingredients really make a difference that you won’t know you were missing until you get yourself a meal here. ← Chimichurri, a Love Affair.